aced with corporate and government corruption seemingly everywhere, it's easy for individual citizens to feel overwhelmed and helpless. No matter how many groups may champion the public cause, they are on the outside while the special interests, with their hands in our pockets, are on the inside. We are steadily losing ground and we will continue to do so until the door is unlocked and our government is forced to deal equitably and openly with all members of the public. Fortunately, we can harness the new Internet technologies, and, by reaching back a few years, we can borrow from the model of southwestern Pennsylvania's three year experiment with proactive public participation (it was so effective, officials pulled the plug when it began to hold them accountable). As a first step, the Pittsburgh Area New Direction Alternative is proposing an Open Government Amendment to the Pittsburgh City Charter. An Initiative and Referendum effort is organizing for the circulation of petitions, which began June 17th. Your help is needed! e are switching the website to a new website protocol. The new design follows the latest Internet standards while striving to be compatable with old browsers. If the design between webpages seems a bit inconsistent, we're still migrating old pages to the new format. When we're done, the site should be consistent throughout and more easily updated. Not all browsers are alike. If something appears wacky in yours, please let us know so we can make the necessary adjustments. You may also want to consider trying one of the new standards compliant browsers by Mozilla, Netscape, or Opera. They tend to better render webpages on your computer screen. Thank you. NOTE: For those who understand website design, this page no longer uses tables, relying instead entirely on cascading style sheets (css). The old tables-based design is still available here. It does not have some of the content on this page, but should still work to get you where you want to go on the PANDA Page. 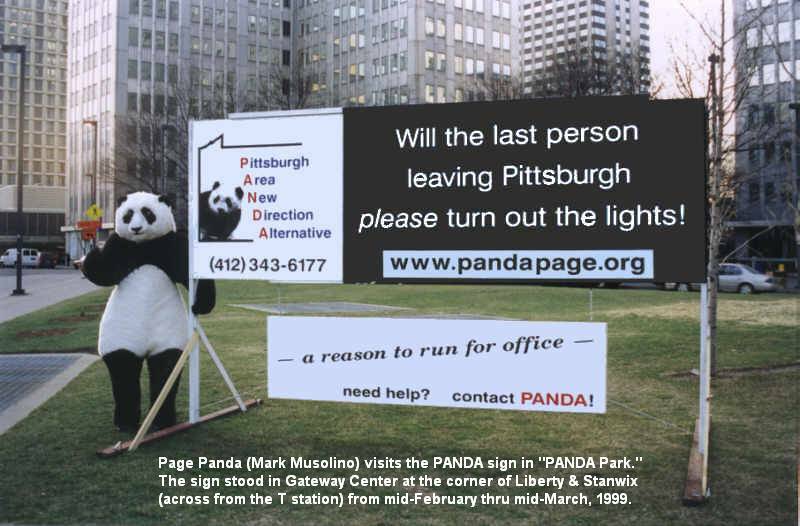 We hope you'll take some time to browse and that you'll help spread the word about the PANDA Page. You're also welcome to comment and make suggestions. Have a proposal you would like to see included? If so, please contact us. "But I don't live in the City of Pittsburgh." Whether or not you live in the City, you can still help. There are a number things to be done. To circulate referendum petitions for the City you must be registered to vote in the City, but we need to hand out literature door to door and at busy locations to educate the public about the proposed Open Government Amendment. We also people to help when we set up a petitioning table with a laptop computer to check people's registration and record when they sign (we have the voter database on CD). "Why should people outside the City want to help?" Because as the largest municipality in the region, it is the tail that wags the dog. What happens in the city affects the region. The problems in southwestern Pennsylvania are in large part a result of ineffectual, incompetent, and corrupt policies in the City of Pittsburgh. By helping the citizens of the City establish a more open government with pro-active public participation, everybody inside and outside the city will benefit. If the current proposal is successfully implemented, it could even prove to be a dramatic redefinition of democratic involvement and serve as a model for elsewhere. Find out more about this exciting effort. ANDA is also advocating a second City of Pittsburgh referendum issue which would amend the City Charter to establish a new Department of Neighborhoods. Other cities across the country have similar departmental structures which coordinate and administer city services with a neighborhood focus. Two years ago, the Neighborhoods USA national convention was held in Pittsburgh and presentations were made explaining how the establishment of this new focus changed and improved city living at the neighborhood level. By drawing upon the experience and innovations of other cities, the City of Pittsburgh can implement a better administrative structure here. At the moment, the plan is to have a Charter Amendment drafted and ready in time to circulate petitions alongside those for the Open Government Amendment. Early discussions have found both to be highly popular ideas and each issue should help the other attract signers when presented together. he photos below first appeared with the inaugeration of the PANDA Page four years ago. The Imperial Grasslands and the historic Greater Pittsburgh Airport terminal building have long since been destroyed and are now merely memories. Nonetheless, they stand as important examples of the corrupt public actions which are taking place in this region, robbing its citizens of their irreplaceable public assets. It is important that we understand what we have lost and how it happened. Look here for more on these issues in the coming months. Young owl chick in its nest at the Imperial Grasslands. Environmental devastation: The Imperial Grasslands, breeding grounds of a Pennsylvania endangered species (the short eared owl) and the habitat of over 205 other species (many rare or unusual), was considered the best bird habitat in western PA. A major attraction for bird watching tourists and local nature lovers, it was closed to public access by the owner when concerns were raised about the environmental impacts as the Turnpike proceeds with plans to build an unnecessary toll road and interchange. The owner then put cattle into the grasslands to destroy the habitat and the nests of the birds. The Environmental Impact Statement for the highway project disclosed that it will not add one more car to the airport than if it were not built at all. The sole purpose of the project is to stimulate real estate speculation around it. Costing hundreds of millions of public dollars, the land owner expects to make a killing after the highway is built. This is a prime example of how subsidized real estate speculaton underlies the process of modern suburban sprawl, even while the region's population is declining. The Veterans Memorial Fountain at the Greater Pittsburgh Airport. Two weeks later, the matter was appealed to Supreme Court Justice David Souter, the Circuit Justice for our district. The County submitted an affidavit saying the rotunda was unstable and had to be taken down immediately. The Justice declined a stay (he couldn't be expected to create a safety hazard), after which demolition work shifted to other parts of the building instead. When they got back to that section again, according to news reports, they had a hard time getting it come down, evidently because it was so stable.